Whole Wheat Spinach Bread and the Healthy Brigade ! Believe me when I tell you that raising a boy is so much easier than raising a girl . Reading this statement you might be confused as whether your visit was to a parenting blog or a food one. Please be assured that it is the latter . If you are still wondering as to what it has got to do with spinach bread , I have some explaining to do. You see, my firstborn is a boy and a perfect candidate for "whatever mama cooks, I will eat," but my daughter who followed him after 4 years is the opposite. Her first question every time she steps off the school bus is, "What are you going to give me for lunch tomorrow?" I might be the Gemini in the house, but she is the one who needs constant variety in her meal without any compromise in taste or quality. Mama dearest has to worry about things being healthy too . That's when spinach paranthas get a makeover and become the even more healthy spinach bread. So, if daughter dearest refuses to take paranthas (more than once in a fortnight) , mama has it covered, Not to mention considerably less mess involved is highly appreciated by me. This particular spinach bread recipe has been loosely adapted from here . As always , I have taken the liberty of doing a lot of substitutions and omissions and the result (I believe) is an even better bake . Loaf pan bakes are my personal favorites ..there is something so wholesome about them . 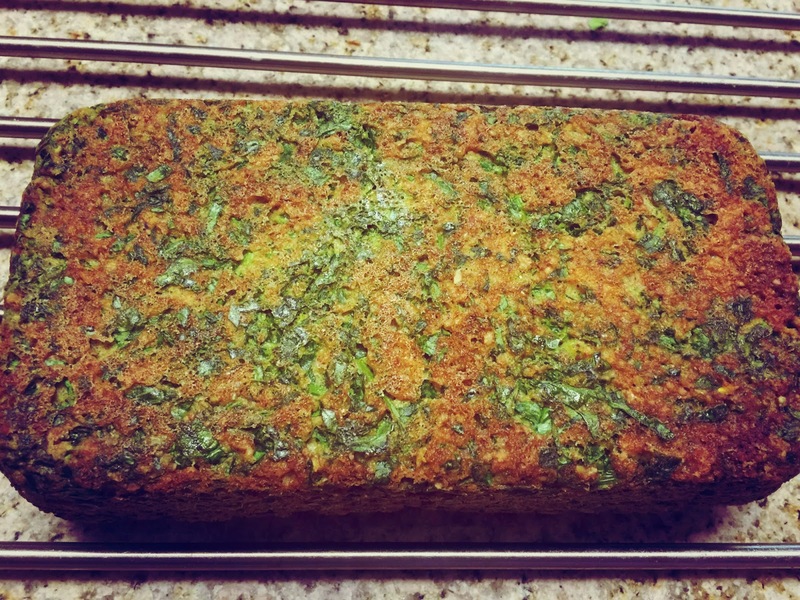 This spinach bread is baked in one too and (as with any other loaf pan bake,) the temperature used is 325 degrees F, as opposed to 350 Degrees F .It is my personal belief that the bake comes out better that way with even texture, and far less cracks . But each oven is different with it own hot spots , so please take the time to figure out what works for you. 1 1/2 cup finely chopped spinach. Preheat the oven to 325 degrees F and grease a loaf pan for the bake. In a bowl , add all the wet ingredients like eggs, yogurt, oil and mix them up well with the help of a whisk. Now , add baking powder, baking soda, Italian seasoning, black pepper, flax meal, almond meal, and salt ,and give a quick mix. Follow that by gently adding the oat flour and the sieved whole wheat flour. Do not over mix after adding flour. Chopped spinach is added at the end, and given a quick fold . Transfer the mixture to the oven and bake for a good 40 -45 minutes, or till a tooth pick comes out clean. Cool on a wire rack and enjoy with a hot cup of tea/coffee, or have it as part of a meal .